Exclusive Beach Colony is located on 11 acres of fabulous beachfront. The ingenious angular living room design transforms every residence into a Corner unit. Wall-to-wall sliding doors and adjoining windows actually wrap around the living room, filling it with light, and revealing the panoramic beauty of the Gulf. The sweeping 300 SF terrace will be a favorite spot for quiet moments and lively gatherings alike. The uniquely situated Master Bath is a world unto itself. The whirlpool bath is surrounded by large, wrap-around windows, which can open to offer both a view and a feel of the hypnotic Gulf. 1750 SF with Tile throughout Living, Dining, Kitchen and Carpet in Bedrooms. Electronics include 55" 4K Ultra HDTV with Digital Video Recorder, DVD in Living Room, 35" LED HDTV, DVD in Master Bedroom, 24 " LED HDTV, DVD in both Guest Bedrooms. Sent many emails about Beach Colony! Also could call to ask questions. Family had a great time! Friendly and accommodating; they went above and beyond! The only downside was having to leave! When I realized I would be arriving later than 5pm, I called and spoke to the office. The lady I spoke with was very friendly and helpful. Explained exactly where to pick up my checkin packet. Upon arrival she was actually just leaving work and got out of her car for me to retrieve my packet. Gave me directions to unit - even went so far to give me street address for my navigation (I'd never been to Perdido Key) Superb!! I hope all of our employees go above and beyond for our patients in this same manner. We had a lovely time. I loved your Memorial Day decorations displayed. We could have used couple more keys and the codes to gate, elevators and pools were a little hard to remember (I thought I left all those passwords at work) but on the other hand, I never found small children playing in the elevators either Thank you again! Our experience was very pleasant and easy. We loved the property so much and the condo was exceptional Just so perfect and charming. 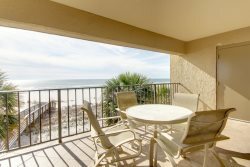 We have stayed at Beach Colony Resort before and will certainly stay again!We love it!